Lately, I’ve been dreaming of Lasagna. I’m pretty sure this makes J very happy, because that man loves Lasagna as well (and of course A will happily devour 5 helpings of any sort of pasta that I put in front of her, my sweet little part-Italian girl!). But my energy is just gone. Seriously, the fact that I manage to get out of bed every morning is nothing short of a miracle, which I know is totally pathetic! I knew there had to be an easier (read: lazier) way to fulfill this craving and then I remembered that I periodically pass various Skillet Lasagna recipes when I scroll through Facebook. Although, I’ve not saved any of them, I figured it couldn’t be too hard to figure it out as I go! So I did just that! Sometimes, you create a recipes that is so delicious in the first shot that you don’t actually have tweek it the next time around- this is one of those recipes and I couldn’t be happier about it. You see, I gave this a try on a night that my parents and Grandma Eve were joining A and I for dinner (J had volleyball, but was thrilled to get the leftovers!). So I was taking a risk and flying by the seat of my pants, but I figured that if all else failed we could always order a pizza. Pizza could not has been more unnecessary because not only did this come together really quickly, it was so delicious that everyone went in for seconds and was raving about the results! 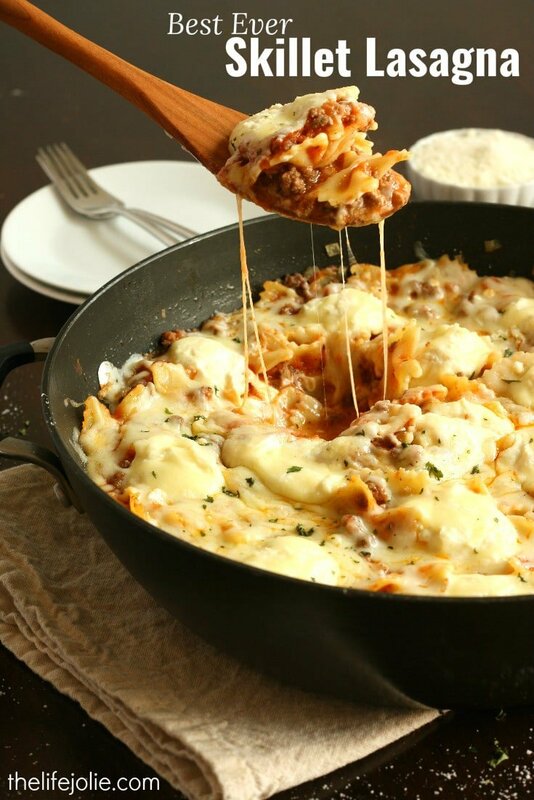 It seems that Skillet Lasagna is the perfect combination of that cheesy, meaty Lasagna goodness without all the hassle. I’ve already made this a few times since it’s debut and the results have consistently been amazing! It’s definitely found a happy home on our dinner rotation and I couldn’t be more thrilled to be able to get all the greatness that Lasagna has to offer with only a fraction of the work and time! Heat your oil in a skillet over medium high heat. Add your onion and garlic and saute for about 5-10 minutes or until the onion has softened. Add your ground beef and some salt and pepper to the pan and saute until browned. Drain the excess oil. Add your pasta, sauce and water to the pan. Cover and simmer over medium heat for 7 minutes. Once the 7 minutes are up, transfer the pasta mixture to an oven-safe dish (unless your pan is oven-safe, then leave it!) and spoon gobs of the cheese mixture onto your pasta mixture. Top with Mozzarella and a generous sprinkling of Romano cheese and place it under the broiler for 3-5 minutes of until the cheese melts. Enjoy it with Romano cheese and if you’re feeling spicy a bit of crushed red pepper or hot pepper oil! February 29, 2016 at 2:54 pm This looks so yummy! March 1, 2016 at 7:04 pm So can't wait to try this!!! March 2, 2016 at 3:48 pm I hope you love it! March 3, 2016 at 10:59 am Me too- it's all about the cheese! I hope you love it! March 6, 2016 at 11:15 am It's all about keeping it simple! March 6, 2016 at 11:10 am Thank you- besides being delicious, my favorite aspect is how easy it is! March 4, 2016 at 8:13 pm Cheesy goodness! This looks amazing! 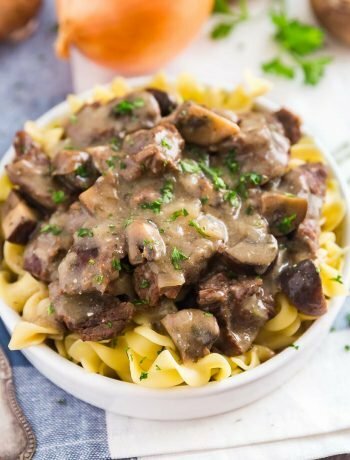 I'll be pinning this to try it with gluten-free noodles! March 6, 2016 at 11:04 am Thank you- The bowties definitely make it easier than cutting up lasagna noodles! March 5, 2016 at 10:59 pm Soooo cheesy!! 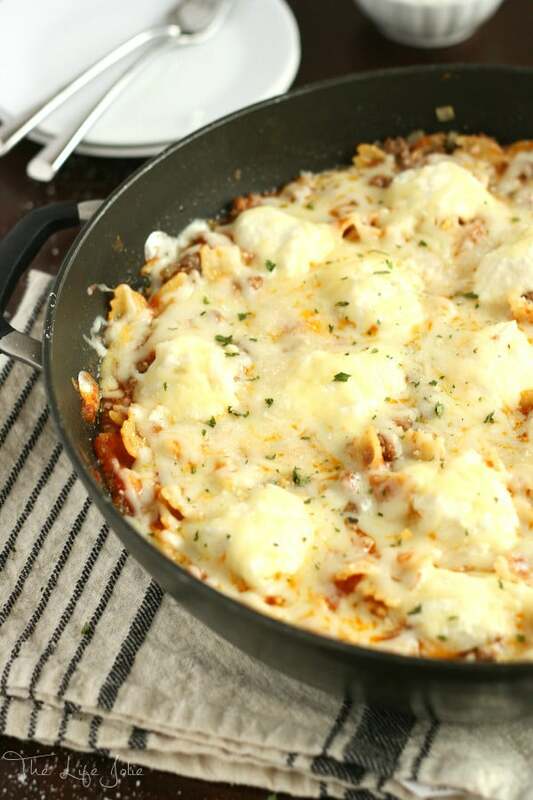 :) I love classic comfort food remade to fit into weeknight schedules! I'll be making this one soon for sure! March 7, 2016 at 2:01 pm Thank you- me too- so much easier!